McKenzie is a constant delight! She has the typical setter clownish personality. McKenzie lives and hunts with relish. She has an easygoing, agreeable, consistent attitude that makes her an asset at home, trade shows, on organized hunts, with pups, and with people. There is nothing you can’t ask of this dog. McKenzie’s enthusiastic, driven side makes her a force to be reckoned with in the field. Her loving, comedian side makes her a joy to have at home. 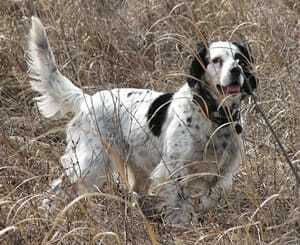 McKenzie is a classic example of how versatile English Setters are. We are very sadden to say Mack is no longer with us. She was my first setter and is the reason i love them. She gave us the best of her everyday.